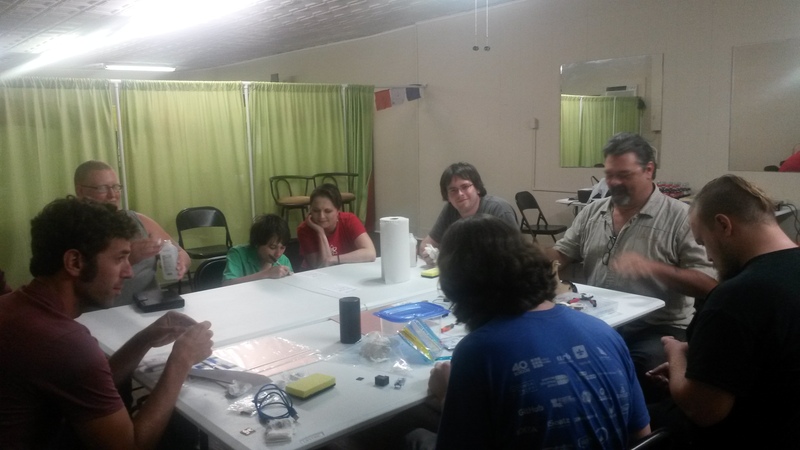 The Picayune Make Event was a great opportunity for community members to come out and experience electronics, circuit board making and test out just about anything! I had never been to a Make event before, and it was a great experience. Ever since I was a child, I was really careful with electronics because they are expensive, and I don't really understand how they work. So if something broke, it was always a total loss. I learned this isn't the case at Picayune Make. Avid Makers were really excited to see old toaster ovens, heating units and printers. Where I would look at this equipment and see yet another money sink, Makers see these things as tools and opportunities to repurpose! While I was in the minority, not categorizing myself as too much of a tinkerer, those who came to the event came from all walks. There were day time mechanics, electricians, gamers, musicians and people of all ages. I found myself comfortable asking questions, and while I didn't always understand all of the answers, I really appreciated the patience that came with a group that's interested in creating "stuff." One aspect of this event that was really interesting was the focus Luc and Dan had on trying to make circuit board making more environmentally sustainable. Luc described that the typical process involves a lot of chemicals and produces a lot of waste. What we were able to do at the event was make circuit boards using basic acids, and leach away coper from a board. Luc even has the process figured out so that he could reverse it and get the coper back out of the acid, leaving this a more closed loop system. Another highlight of the event was taking the circuit boards we made and testing them out on a car battery, as seen in the title image. I made sure to stand back as jumper cables were hooked up to the car and one of our circuit boards made a _shocking _ connection! In their future events, the Makers are interested in building a cooling unit for some of their solder paste which needs to be kept cool. Looking forward to seeing what other neat things come from Picayune Make. As for myself, I will never view electronic "junk" the same. Thanks again to Rackspace for their support of this event! I just now found you note. Sounds like you had a good time. Thanks for coming out.